This review originally ran in AP 295. Here’s the one problem Black Veil Brides will always encounter: No matter how good their music is, there is a reasonably sized portion of the population who will never hear it primarily because Black Veil Brides still look like Black Veil Brides. That’s bound to turn a number of people off from the get-go. To those detractors, we say this: You should know that this is one hell of a rock record. 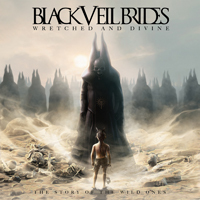 Wretched And Divine: The Story Of The Wild Ones is Black Veil Brides’ most elaborate work to date. 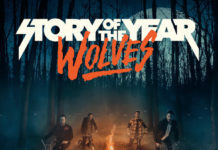 It’s surprisingly well written and engaging, with the band moving further and further away from both the metalcore tag that hampered their early work and the hair-metal label applied to them the last time around. Credit should definitely go to John Feldmann, the producer responsible for smoothing the edges and enhancing the radio-friendliness of everyone from the Used and Saosin to Neon Trees and Foxy Shazam. 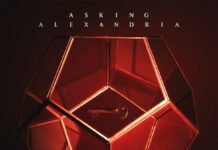 The man knows his way around a song, and teaming him up with frontman Andy Biersack has drawn out the singer’s best vocals to date. Feldmann doesn’t get too much in the way of guitarists Jinxx and Jake Pitts, allowing them to shine in proper context (“Shadows Die,” “I Am Bulletproof”) without stepping all over the melody. Given his hands-on approach with the bands he records, it’s likely Feldmann will have a co-writing credit on the album, too. This part isn’t so surprising, as there are many, many moments on Wretched And Divine that recall elements of previous albums he’s produced by Atreyu, Destroy Rebuild Until God Shows and the Used, to name a few. (Hell, Used frontman Bert McCracken even pops up with a guest vocal in “Days Are Numbered,” further cementing the comparison.) Of course, that’s what you get with Feldmann: consistency, both sonic and artistic. Not exactly cookie-cutter, but not entirely original, either. Still, the band deserve accolades for pushing themselves outside their comfort zones and turning in a record that, while not Kid A, is certainly challenging for the average Rock On The Range attendee. A concept album that serves as the origin story for the band, who are represented as their Black Parade/Killjoys-esque alter egos “the Wild Ones,” Wretched And Divine twists and turns through its 19 tracks, pausing occasionally for brief narration provided by Aiden/William Control mouthpiece Wil Francis. 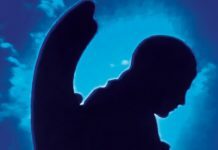 The story has something to do with a post-apocalyptic future where society is being oppressed by the government (think The Terminator meets The Matrix), but it’s not nearly as convoluted as your average Coheed And Cambria record. It’s just a vehicle to deliver some of BVB’s strongest material to date (the anthemic “New Year’s Day” and “In The End,” which is 30 Seconds To Mars on steroids), as well as a handful of clunkers (the soggy campfire ballad “Done For You” and the dreary, gospel choir-fied power ballad “Lost It All”). So really, it’s like BVB’s other output in that it’s not perfect, but the high points are still pretty damn high.